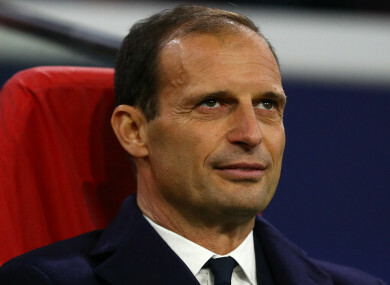 JUVENTUS HEAD COACH Massimiliano Allegri said he will remain with the Serie A club despite their Champions League quarter-final defeat to Ajax. Juve’s quest for European glory was put on hold for another season following Tuesday’s shock 2-1 second-leg loss at home to Ajax. Cristiano Ronaldo’s opener was cancelled out by Donny van de Beek and Matthijs de Ligt, who led Ajax to a memorable 3-2 aggregate victory. With Juve poised to claim an eighth consecutive Scudetto, it left the Italian giants – who were runners-up in 2015 and 2017 – still searching for their first Champions League crown since 1996. However, Allegri is set to remain in Turin after telling Sky Sport Italia: “I met the president a couple of days ago and told him that I will stay at Juventus. “We’ve said since the summer that the Champions League is an objective and will be every year. This was a relatively young starting XI tonight, so it can grow with Allegri on the bench. Five-time Ballon d’Or winner Ronaldo, who also scored in the first leg, gave Juve a 28th-minute lead with his 126th Champions League goal. However, Ronaldo’s semi-final run – dating back to 2009-10 – came to an end as giant-slaying Ajax produced another upset, just like they did against reigning champions Real Madrid in the last 16. Email “Allegri says he'll stay on at Juventus despite Champions League quarter-final exit”. Feedback on “Allegri says he'll stay on at Juventus despite Champions League quarter-final exit”.